The Boeing KC-135 Stratotanker is an aerial refueling military aircraft. It and the Boeing 707 airliner were developed from the Boeing 367-80 prototype. The KC-135 was the US Air Force's first jet powered refueling tanker and replaced the KC-97 Stratotanker. The Stratotanker was initially tasked to refuel strategic bombers, but was used extensively in the Vietnam War and later conflicts such as Desert Storm to extend the range and endurance of Air Force, Navy and Marine tactical fighters and bombers. 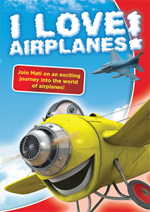 Serving with the United States Air Force since 1957, it is one of just six military fixed wing aircraft with over 50 years of continuous service with its original operator. Supplemented by the larger KC-10, complete replacement is still under study by the Air Force. Despite increased maintenance costs, studies conclude many of the aircraft could be flown until 2040, with ages reaching 80 years before reaching lifetime flying hour limits. Like its sibling, the commercial Boeing 707 jetliner, the KC-135 was derived from the Boeing 367-80 jet transport "proof of concept" demonstrator, which was commonly called the "Dash-80". As such the KC-135 is similar, but has a narrower fuselage and is shorter than the 707. Boeing gave the future KC-135 tanker the initial designation Model 717. In 1954 USAF's Strategic Air Command held a competition for a jet powered Aerial refueling Tanker. Lockheed's tanker version of the proposed Lockheed L-193 airliner with tail mounted engines was declared the winner in 1955. Since Boeing's proposal was already flying, the KC-135 could be delivered two years earlier and Air Force Secretary Harold E. Talbott ordered 250 KC-135 tankers until the Lockheed's design could be manufactured. In the end, orders for the Lockheed tanker were dropped rather than supporting two tanker designs. Lockheed never produced its jet airliner, while Boeing would eventually dominate the market with a family of airliners based on the 707. In 1954 the Air Force ordered the first 29 of its future fleet of 732. The first aircraft flew in August 1956 and the initial production Stratotanker was delivered to Castle Air Force Base, California, in June 1957. The last KC-135 was delivered to the Air Force in 1965. Developed in the early 1950s, the basic airframe is characterized by swept wings and tail, four underwing mounted engine pods, a horizontal stabilizer mounted on the fuselage near the bottom of the vertical stabilizer with positive dihedral on the two horizontal planes and a hi-frequency radio antenna which protrudes forward from the top of the vertical fin or stabilizer. These basic features make it strongly resemble the commercial Boeing 707 and 720 aircraft, although it is actually a different aircraft. The KC-135Q variant was modified to carry JP-7 fuel necessary for the SR-71 Blackbird, segregating the JP-7 from the KC-135's own fuel supply (the body tanks carrying JP-7, and the wing tanks carrying JP-4 or JP-8). When the KC-135Q model received the CFM-56 engines, it was redesignated the KC-135T model, which was capable of separating the main body tanks from the wing tanks where the KC-135 draws its engine fuel. The only external difference between a KC-135R and a KC-135T is the presence of a clear window on the underside of the empennage of the KC-135T where a remote controlled searchlight is mounted. It also has two ground refueling ports, located in each rear wheel well so ground crews can fuel both the body tanks and wing tanks separately. In order to expand the KC-135's capabilities and improve its reliability, the aircraft has undergone a number of upgrades. Among these was the Pacer-CRAG program (CRAG=Compass, Radar And GPS) which ran from 1999 to 2002 and modified all the aircraft in the inventory to eliminate the Navigator position from the flight crew. The program development was done by Rockwell Collins in Iowa and installation was performed by BAE Systems at the Mojave Airport in California. The latest block upgrade to the KC-135 is Block 40.4 which allows the KC-135 to comply with CNS/ATM. All KC-135s were originally equipped with Pratt & Whitney J-57-P-59W turbojet engines which produced 10,000 lbf (44 kN) of thrust dry, and approximately 13,000 lbf (58 kN) of thrust wet. Wet thrust is achieved through the use of water injection on takeoff. 670 gallons of water are injected into the engines over the course of two and a half minutes. This water allows a second set of fuel injectors to activate without melting the turbine buckets. 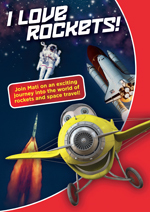 The water turns to steam and is ejected out the rear of the engine, increasing the mass through the engine and increasing thrust. The engine runs a little hotter, with more engine noise. In the 1980s the first modification program re-engined 157 Air Force Reserve (AFRES) and Air National Guard (ANG) tankers with the Pratt & Whitney TF-33-PW-102 engines from 707 airliners retired in the late 1970s and early 1980s. 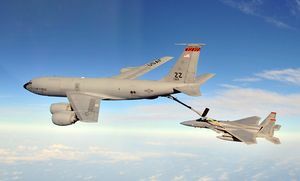 The re-engined tanker, designated the KC-135E, was 14% more fuel efficient than the KC-135A and could offload 20% more fuel on long duration flights. (The difference is that the A-model weighed only 104,000 lb (47,000 kg) empty, while the E-model weighed 115,000 lb (52,000 kg) empty. But the maximum takeoff weight was not increased for the E-model. Therefore, the A-model could takeoff with 200,000 lb (91,000 kg) of fuel, while the E-model could only takeoff with 190,000 lb (86,000 kg) of fuel.) Only the KC-135E aircraft were equipped with thrust-reversers for takeoff aborts and shorter landing roll-outs. The KC-135E fleet has since either been re-engined into the R-model configuration or placed into long term storage ("XJ"), as Congress has prevented the Air Force from formally retiring them. The final KC-135E, tail number 56-3630, was delivered by the 101st Air Refueling Wing of the Maine ANG to the 309th Aerospace Maintenance and Regeneration Group (AMARG) at Davis-Monthan AFB in September 2009. The second modification program re-engined 500 aircraft with new CFM International CFM56 (military designation: F108) engines produced by General Electric and Snecma. The CFM-56 turbofans are capable of producing approximately 22,500 lbf (100 kN) of thrust, nearly a 100% increase in power compared to the original J-57 engines. The re-engined tanker, designated either the KC-135R or KC-135T, can offload up to 50% more fuel (on a long duration sortie), is 25% more fuel efficient, costs 25% less to operate and is 96% quieter than the KC-135A (sideline noise levels at takeoff were reduced from 126 to 99 decibels). Picture - Multi-Point Refueling System paradrogue and hose. The hose is 74 feet long when fully trailed. 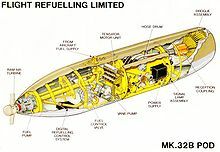 Picture - Cutaway of the Flight Refueling Limited Mk.32B Refueling Pod. Picture - USAF KC-135R Stratotanker of the 100th Air Refueling Wing (USAFE) at RAF Mildenhall, UK. Picture - KC-135 winglet flight tests at Dryden Flight Research Center. The KC-135R has four turbofan engines, mounted under 35-degree swept wings, which power it to takeoffs at gross weights up to 322,500 pounds (146,300 kg). 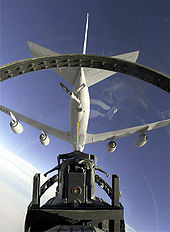 Nearly all internal fuel can be pumped through the tanker's flying boom, the KC-135's primary fuel transfer method. A special shuttlecock-shaped drogue, attached to and trailing behind the flying boom, may be used to refuel aircraft fitted with probes. 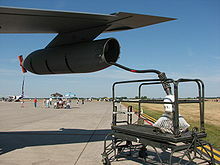 A boom operator stationed in the rear of the aircraft controls the boom while lying prone. A cargo deck above the refueling system can hold a mixed load of passengers and cargo. Depending on fuel storage configuration, the KC-135 can carry up to 83,000 pounds (38,000 kg) of cargo. Picture - An F-15 backs out after refueling from a KC-135R. The KC-135 was initially purchased to support bombers of the Strategic Air Command, but by the late 1960s, in the Southeast Asia the KC-135 Stratotanker's ability as a force multiplier came to the fore. Midair refueling of F-105 and F-4 fighter-bombers as well as B-52 bombers brought far-flung bombing targets within reach, and allowed fighter missions to spend hours at the front, rather than just a few minutes, due to their limited fuel reserves. KC-135 crews refueled both Air Force and Navy / Marine Corps aircraft, though they would have to change to probe and drogue adapters depending upon the mission. Crews also helped to bring in damaged aircraft which could fly while being fed by fuel to a landing site. KC-135s continued their tactical support role in later conflicts such as Desert Storm and current aerial strategy. The KC-135 is joined by the Tupolev Tu-95, the C-130 Hercules, the B-52 Stratofortress, the English Electric Canberra and the Lockheed U-2 in having over 50 years of continuous service with its original operator. See Boeing C-135 Stratolifter for further details on the C-135 family. Original production version powered by four Pratt &amp; Whitney J57s, 732 built. All four RC-135As were modified to partial KC-135A configuration in 1979. 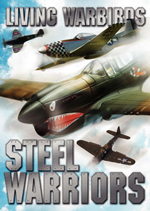 They were given a unique designation as they differed from the KC-135A in that they were built with a flight engineers position on the flight deck. 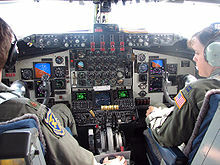 The flight engineer's position was removed when the aircraft were modified to KC-135 standards but they retained their electrically-powered wing flap secondary (emergency) drive mechanism and second air conditioning pack which had been used to cool the RC-135As on-board photo-mapping systems. Later re-engined with Pratt &amp; Whitney TF33 engines and a cockpit update to KC-135E standards in 1990. 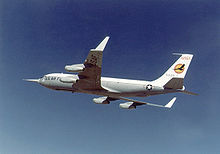 Air National Guard and Air Force Reserve KC-135As re-engined with Pratt &amp; Whitney TF-33-PW-102 engines from retired 707 airliners (161 modified). 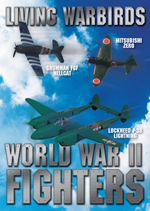 These aircraft are being retired to Davis-Monthan Air Force Base and replaced with R models. An airborne command post modified in 1984 to support CINCCENT. Aircraft 55-3125 was the only EC-135Y. Unlike its sister EC-135N, it was a true tanker that could also receive in-flight refueling. Pratt &amp; Whitney TF-33-PW-102. Currently retired at AMARC. 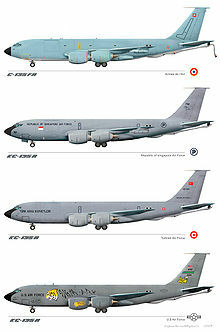 Republic of Singapore Air Force has 4 tankers. Turkish Air Force operates 7 KC-135s. United States Air Force operated 449 KC-135s (192 active duty, 64 reserve, and 173 guard) as of September 2009. On 10 September 1962, KC-135 s/n 60-0352 on a flight from Ellsworth Air Force Base to Fairchild Air Force Base crashed into a mountain just 20 miles (32 km) northeast of Spokane, Washington. The flight hit fog on approach to the air base. The crash killed all 44 crew and passengers on board. On 16 January 1965, USAF KC-135A-BN Stratotanker, 57-1442, c/n 17513, crashed after an engine failure shortly after take off from McConnell Air Force Base, Kansas. The fuel laden plane crashed at a street intersection and caused a huge fire. 30 were killed, 23 on the ground and the 7 member crew. 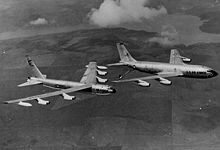 On 17 January 1966, a fatal collision occurred between a B-52G and a KC-135 Stratotanker over Palomares, Spain causing severe radiological contamination. On 4 October 1989, a KC-135 Stratotanker from Loring Air Force Base crashed into a hill along the west side of Trans-Canada Highway 2 2 mi (3.2 km) north of Perth-Andover, New Brunswick. in Carlingford, New Brunswick killing 4 crewmembers. Picture - Six KC-135 Stratotankers demonstrate the elephant walk formation.